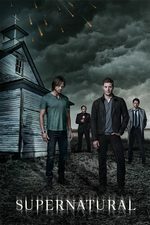 Sam and Dean work on a case involving the ghost of a demented doctor; they get assistance from an unexpected source. 1) I liked Sam trying to help Dean through whatever funk this is. I feel like we haven't seen that enough from these two. Feels like growth, to be working through something rather than pouting and alienating each other. Growth, but it's also believable. Bullets, Bacon, Booze. 2) Billie got a promotion. Nice turn of events. I loved the conversation between Billie and Dean--he's basically suicidal at this point, after everything they've lost, but she sends him back because now she can see that the world needs Winchesters. It was kind of a surprising twist, IMO. Normal SPN goes down some weird Dean-Is-Stuck-In-The-Veil rabbithole and Sam does something shocking and ill-advised to bring him back to life. This was better. Ah, but is it really Castiel? On the other hand we have already done Castiel is not Castiel. I didn't even think of this and now I feel dumb and sad. I retract my kermitflail. I don’t know, I’m not all that worried that it’s Void-Castiel pretending to be actual-Castiel. I mean, even if it has decided to involve itself with the Winchesters and Jack for some voidly reason, we know that Actual-Cas is no longer dead. Before we saw him I had been legitimately worried we would end up with some doesn’t-know-the-Winchesters-Cas from the alternate reality and all the Dean angst that would entail. So, even if they draw this out with an impersonation, they’ve confirmed that Actual-Cas lives, which makes him rescue-able. While I'm sad that my theory that Misha Collins would return to play an aged up Jack didn't pan out, I am looking forward to see how Jack and Cas play off each other. I thought this was a pretty solid episode. The plot made sense, there was character growth like terilou said, and I love the way they brought back Billie. I hope she always stays a reluctant ally. I liked Sam trying to be extra-nice to Dean because he knew Dean was sad, especially combined with last week, where he was kind of coaching Jack around like, "okay, I know Dean is being a dope to you, but try it this way" because he actually does know this dude he's lived in a car with for like thirty years at this point. I also liked that his actual plan, to try and subtly give Dean little things that would make him happy, was so simple and (bless) kind of hamfisted. He's maybe not playing at the top of his emotional range there, but also, taking care of Dean is still outside their most natural dynamic, and something he has to work at doing well (which is different from wanting to make sure that Dean's okay; he always wants that, but I don't think he was ever allowed to actually try and take care of Dean till they were both adults, and even then only very rarely and usually involving disaster at both ends.) Usually Sam's most healthy response to Dean being Not Okay is to very slightly panic and then try to feed him until matters somehow improve, so this is actually a pretty good development for them. I was glad to see Billie back, I hope she sticks around. She might be a good addition to the spinoff too, actually. I don't think I have an opinion yet on whether that's really Cas; I didn't watch the Void scenes closely enough to know whether Void Guy might have any possible interest in 1) coming to Earth and 2) impersonating Castiel to the Winchesters. I think I'm rooting for it to be Cas, to get the Evil Twin drama out of the way and to see him and Jack together. As I get older, I find I get a lot more upset about horror stuff where kids die. I mean, I never liked watching teens get killed in slasher movies, even when I was a teen, but now it seems more tragic to me than it used to. I felt really bad for these kids, and the devastated mom of the one kid. Their fate just seemed so harsh and awful, and the closest they got to a happy ending was poofing away to the afterlife. That's not to say it was a bad episode, or the show went darker than it should have. I mean, it's a horror show. Horrifying things happen. But I really hoped those boys were gonna get saved, somehow. They were just dopey little babies! It's funny how Castiel has been killed so many times it's nearly routine, and we knew he was coming back, but somehow this return did have some real emotional heft. Of course, that Steppenwolf song had a lot to do with it. I'd never heard it before, and Jesus, that was a gut-puncher. I also liked the moment when Dean almost kept the truth about Billie from Sam, but then coughed it up. They spent entire seasons keeping these huge, often inexplicable secrets from each other, and this did feel like a nod to that and progress of a sort. No more big secrets for no reason! Yeah I also appreciated Dean just spilling it for once, and Sam rightly making him. I'm looking forward to more Billie, the actress is really nailing that "I really wish I could throw you into the void but goddammit I can't" look. I don't care if it's void-Cas, #kermitflail away! I don't think it is though, the void seemed more intent on going back to sleep. Sam being all, "hey, wanna check out the Golden Clam?" (or whatever it was) cracked me up. Also, Dean's very casual and sudden "oh, gonna go kill myself now, be back in three minutes" in an episode where we were already reminded that the Reapers object to that made me go "dude, what?" Though of course he's suicidal, and he only asks for the problem to be solved, not that he cares about going back. And then Billie's change of heart...damn. Wow. I enjoyed this one for reasons you guys have already touched on: I feel like the Winchesters have grown, (in prior seasons this secret would've been season-long), I'm glad to see Castiel and I thought Billie's change of heart was way more interesting than her promise to toss them to the Empty. Billie's fine, but I can't stop wishing the original Death would come back. This is my one complaint there too - I really liked original flavor Death. I mean, Billie's cool and all, (and has the right poise for the job), but he was pretty great, and I miss his food obsession.